Historiated initial E, illuminated leaf from a Gradual. Flanders, possibly Bruges, c. 1390-1400. Ink, tempera, and gold on vellum. Leaf: 430 x 310 mm. Initial: 75 x 80 mm. Historiated initial 'E', illuminated leaf from a Gradual. Leaf: 430 x 310 mm. Initial: 75 x 80 mm. Quite a fine portrait of a bishop, in the hand of an interesting illuminator, who has not yet been identified, as no sister leaves are known. The bishop confessor is clearly defined and expressively portrayed. The artist wielded his pen with movement, showing his expertise and talent also in the preliminary, but animated sketch in the bas-de-page. The graceful, saintly Bishop shares stylistic traits with the masters of the pre-Eyckian style, who likely worked in the period of c. 1390-1400 and whose work is attributed to Bruges, Ieper, and Tournai (French-Flanders and Artois), often with bas-de-pages showing secular themes of nature, drolleries, and other motifs. The illuminator’s style indicates his Flemish artistic background, and his work precedes that of the circle of Robert Campin in Tournai (c. 1415). 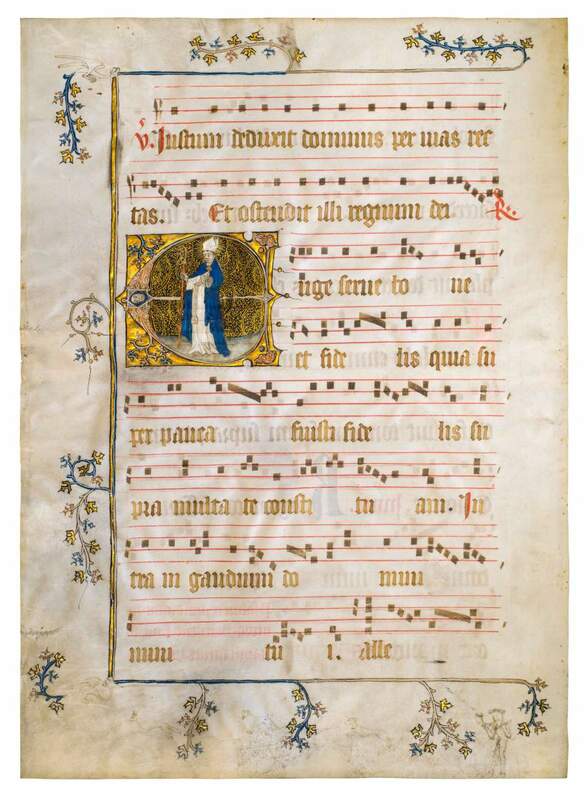 This leaf, originally part of a Gradual, contains the text and chant for the Mass including the Common of a Holy Confessor Bishop.